When the breathtaking news arrived, everybody mourned. 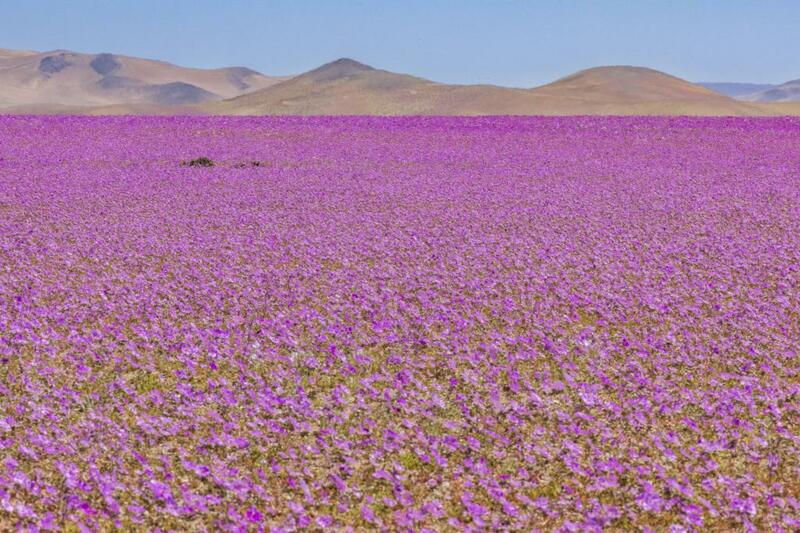 “Desierto florido”, or flowering desert, returned to the Atacama Desert in Chile, the earth’s driest place, some four years before the usual time. The 127,000 sq km desert hosts the Desierto florido once every five-seven years. The desert blooms with over 200 species of flowers. The extremely arid landscape—it is the proxy on earth for the settings of almost all movies on Mars—metamorphoses into an unbelievable world of colours. It is popularly believed that the Desierto florido enthuse people more than a prime soccer event. Those who witness it invariably invoke a sense of devotional surrender to the mystique nature. In August 2017, nature wished to take a break from her routine; maybe to pause and shout out a message. This month when the Desierto florido returned to Atacama, it ditched its usual five-seven years cycle. An unusual spell of rains preceded the flowering; almost putting at stake the place’s undesirable, but much-revered superlative of being the driest place on earth. Just two years ago, the desert experienced the flowering. Thousands of websites uploaded dispatches of stories and photographs of the 2015 flowering. To begin with, Chile and countries that share borders with the Atacama believed it was a god-sponsored excursion. For hundreds of geologists and climate experts, who usually scavenge such harsh landscapes for clues to everything that concerns human existence, it raised many questions, instead of a bout of happiness over getting a bonus opportunity to study the area. With heavy pinches of shock, many asked: why did it come back so early? Are regular rains the new identity of the desert? Will the Desierto florido be frequently giving the desert a diametrically opposite ecological look? Or was it just a freak incident? Those who have grown up around the desert would not agree that this break in the cycle of flowering was exceptional. Every discussion around Atacama revolved around the unusual weather events. The desert flowering happens when it rains in the region and it had been raining much more than the average level in the recent past. Atacama’s geography is its ecological destiny. The majestic Andes Mountains block clouds from the region, while the cold currents in the Pacific Ocean don’t trigger moisture-laden winds to keep the desert enveloped with water particles. It does rain, but the average annual rainfall of the region is just 15 millimeters (mm). Only during the El Niño phenomenon, it rains due to warmer ocean currents. This happens once in 2 to12 years, with a gap of five years. Stories from the world’s driest region rival any piece of magical realism fiction. Arica, Chile’s northernmost city in Atacama, and just 18 km from the border of Peru, is fabled as having the lowest rainfall rate in the world. It has a world record for the longest dry spell: it didn’t rain here for 14-and-half years consecutively in the early 20th century. In nearby Antofagasta city, it rains just 1.8 mm a year. There is a wide network of weather stations in the region, but many stations in the Atacama never recorded any rain. Geological studies reveal the desert did not receive any rainfall between 1570 and 1971. One feels a chill in the desert even during day time. This is due to the high altitude of the location. But such is the absence of water content in the ecosystem that its 6,885 metre tall mountains don’t have glaciers. British scientists suggest that some riverbeds have been dry for over 120,000 years. Such is the hostile environment that many are convinced that if life has been sustaining here, there must be life on other planets like Mars sharing similar landscapes. In February 2017, a team of scientists from the National Aeronautics and Space Administration (NASA) and many universities in the US landed in Atacama with this conviction. They were testing an instrument that is used to search for signs of life in other planets, like Mars. In May 2017, Atacama offered an answer. Heavy rains lashed the region that continued for close to a month. The National Emergency Office of Chile’s Ministry of Interior and Public Security put the region on red alert. The municipality of Diego de Almagro in the region was affected by the flooding of the Salado river. Tourists were stranded; nearby port towns were closed. Though the government was still measuring the intensity of rain in November 2017, many media reports said the rainfall was more than 700 per cent of the annual average; in many places it was more than 1,000 per cent. This spell caused the untimely drought flowering. Atacama is a mine of buried seeds of mallow flowers from earlier flowerings. The seeds just came to life at once. Of late, such unheard of weather events are becoming part of the 21st century lore of Atacama. On March 24, 2015, parts of the desert recorded 2.4 cm of rain or 14 years worth of rainfall in just one day. In Antofagasta town, it rained 2.2 cm or the region’s total rainfall in a year in just 12 hours. The usually dry Copiapo river was flooded. Chile declared a national emergency to facilitate relief and rescue operations. Unlike the rain in May 2017, this extreme rain spell was triggered by the El Niño phenomenon. Usually, Desierto florido coincides with this weather event. Deputy Interior Minister Mahmud Aleuy said the flooding was the “worst rain disaster to fall on the north (of Chile) in 80 years”. And in October the desert bloomed, the last one to keep the cycle of five-seven years but rated as the “most spectacular in 18 years”. Four years ago, in July 2011, Atacama had a brush with another unusual event, snowfall. According to the Chilean government, the desert region received up to 80 cm of snow, never seen in the preceding 20 years. “Ordinarily, the flashes of white in South America’s Atacama Desert rise from salt pans. But on July 7, 2011, when the Moderate Resolution Imaging Spectroradiometer (MODIS) on NASA’s Terra satellite acquired these images, much of the white came from a far rarer commodity: snow,” read NASA's media release. In August 2013, residents witnessed another snowfall that they thought was the worst in three decades. Never used to snow, even at high altitudes, frequent snowfalls raised the fear of flooding as the snow melted. Scientifically and figuratively, Atacama is the new landscape to witness the impacts of climate change in its totality. “The Atacama is so dry that as a child, I could read at night just by using the static electricity generated by my hand being rubbed against my bed linen,” Armando Azua-Bustos, founder & CEO, Atacama Biotech, was quoted in an interview. Armando is now steering scientific experiments to look at how life adapted to such a hostile environment, thus carrying clues to wider adaptation to climate change. Scientists pointed out that Atacama faced an abrupt change in climate to be fated to this condition. The local residents of this lonely part of the planet had already perceived an imminent change in the local climate. But they were not alone. Their “never before experience” with weather was also not a freak development, but part of a planetary level change sweeping across the globe. And this change was unfolding in extreme weather events, often contrasting, spanning continents, geography and demography. As it turned out, in the long-term, all of us are victims of deadly weather events. On June 20, 2017, the world observed a landmark in its fight against climate change: the 25th year of the signing of the UN Framework Convention on Climate Change (UNFCCC). This was the response of governments from across the world to the reality of climate change. In late 1992, some 1,700 scientists wrote a letter to the world that gave that first “warning to humanity”. This letter, for the first time, informed the world about the human-induced changes in climate. “If not checked,” wrote the scientists, led by particle physicist and Union of Concerned Scientists Co-founder Henry Kendall, “many of our current practices put at serious risk the future that we wish for human society and the plant and animal kingdoms, and may so alter the living world that it will be unable to sustain life in the manner that we know”. Through its 25 years of journey, the global agreement on climate change and the ways and means to fight it has witnessed highly polarised debates. Countries, mostly developed, denied climate change while developing countries always accepted its reality as the victims. Now there is unequivocal acceptance among developed countries, with the noted exception of the US. Climate change is secular; extreme weather events now occur everywhere, irrespective of geography and economic status. Science, like before, is definitive on climate change. The only thing that now pushes countries to accept climate change is the frequency and ferocity of extreme weather events, invariably a fallout of the warming globe and the resultant disruption in climate patterns. After 25 years, in a communiqué published in BioScience, more than 15,000 scientists from 184 countries assessed the world's latest responses to various environmental threats. Once again, they found us sorely wanting. “Humanity has failed to make sufficient progress in generally solving these foreseen environmental challenges, and alarmingly, most of them are getting far worse,” they wrote. This letter was termed as the “second notice” to humanity. Just before the 23rd Conference of Parties (CoP) to the UNFCCC began from November 6-17, 2017 in Bonn, Germany, for the annual stocktaking on the climate change regime, The Lancet released a devastating assessment. On October 30, The Lancet Countdown on Health and Climate Change estimated that an additional 125 million adults, or more than seven times the total population of Chile, had joined the ranks of those vulnerable to climate change between 2000 and 2016. During the same period, weather-related disasters increased by a startling 46 per cent. In 2016, climate change cost a whopping US $129 billion to the world. It noted an increase in weather-related disasters with 306 disasters recorded on an average between 2007 and 2016, a 46 per cent increase compared to the 1990-99 average. More than 90 per cent of all disasters had been associated with weather-related events in the last 20 years, with Asia being the continent which was most affected. This number had been on the rise since 1990, around the time when negotiations at the UNFCCC gained momentum. The report stated that 2,843 events were recorded between 1990 and 2016, affecting 4•8 billion people and killing about half a million people, most of which had happened in poor or developing countries. The report’s credibility is impeccable—24 academic institutions and intergovernmental organisations came to this conclusion using 40 indicators. Going by this report, it is one weather-related disaster a day for earth to remind humanity of the full-fledged unfolding of the impacts of a changing climate. The report noted that climate change disproportionately affected citizens in low-income countries which suffered 99 per cent of the damage-related costs. But 2017 had messages for the developed countries too, particularly the US. (This article was first published in the book Climate Change Now under the headline 'Atacama, floods and the inevitable Harvey').